The day started early for us with our jetlag, followed quickly by a great buffet breakfast at the Honey Badger. Typically, we start our hikes around 8am at home, with an early drive. Here, we had to wait until 930am to get started…it felt like an eternity. It wasn’t so bad, as we sat at the bar waiting for our luggage to get weighed and prepared for the porters to carry. This gave us the opportunity to say good bye to our new Edmontonian friends. Daniel had arrived and given us some sleeping bags to choose from, water bottles, hiking poles and gloves. Weighing our luggage outside of our hotel. Porters are not allowed to carry over 33 lbs. The drive to the base was really interesting. In the van was Daniel and our cook, Chepazul (aka ‘chef’). After dropping off the unnecessary rentals at the shop in Moshi, we picked up Thomas – co-owner of Tro-Peaks with Daniel. He was a really happy guy and spoke perfect English. We passed millet patches on the side of the road that is used for a local liquor. He explained how he and Daniel went to school locally, after getting sponsorship due to costs at the local university. They met and long-short, started Tro-Peaks. 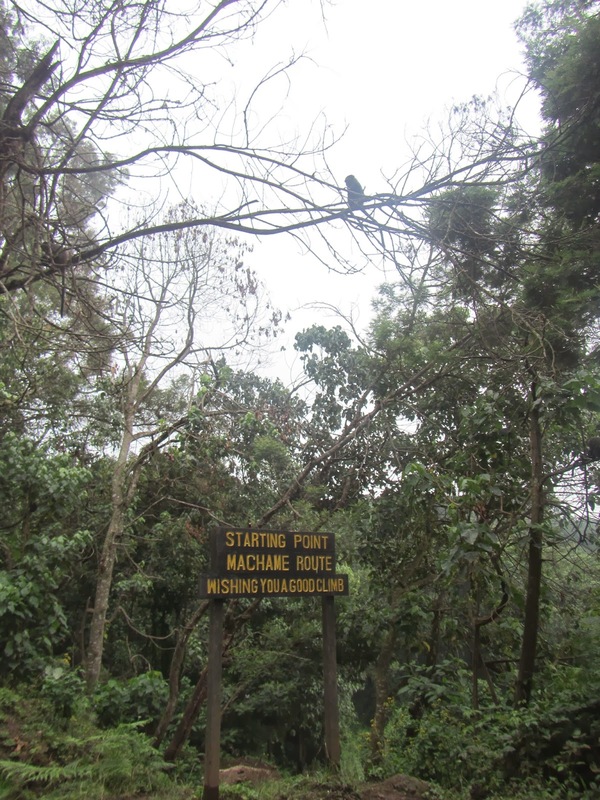 The drive was long but interesting, as we travelled into the Macheme tribe region near the start of our trek. We saw van buses that were so full, people were holding onto ropes hanging off to the left of the vehicle. I was waiting to see the van tip over personally! Lol. Towards the end of our journey up to the start, we stopped to obtain meat on the side of the street for our dinners….ten minutes later, we picked up chicken. This area was just what I’d think of when I think of Africa. Rough foliage, small shops with coca-cola signs, women in colorful fabrics and bags of items or trays of bananas on their head, sugar cane and rebar abound. Millet harvest was on. The beige mats you see have a grain on them used to produce a local wine liquor. When the bus is full, they hang on the side. The rope on the back…thats for when the sides are full. Upon arrival, there was a large gathering of locals waiting for the opportunity to work as a porter and a few stragglers wanting to sell merchandise. Upon passing through the official gate of the park, it was tourist vehicles galore and a large number of hikers preparing for the days ahead. We had to sign into the official log book with our passports and the permit number Daniel had obtained. We sat in the ‘tourist’ area until things were organized. Tro-Peaks was VERY well organized and had their crew hired before arrival, thus no extra porters were required and our wait was minimal. We did however see many of the larger companies pick up lines of porters and march them into the gate and prepare them for the journey. 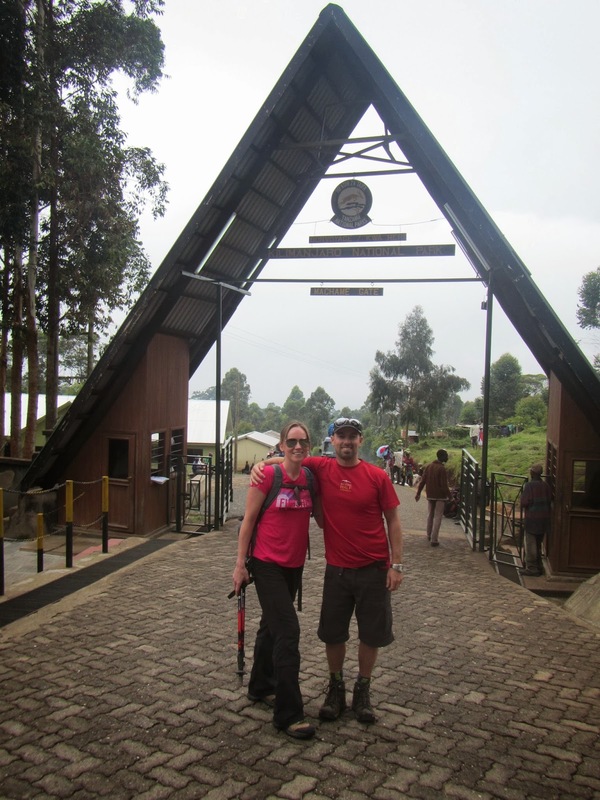 The gate into Kilimanjaro National Park…our starting point. So fitting…a monkey at the entrance sign. In that time, Chepazul arrived with our lunch. Another group had a large picnic set-up in the area and so we assumed we were to eat the lunch. I ate the chicken, which was sensational, and the boiled egg (probably within 2 minutes) before Daniel asked why we were eating lunch already. Oops. We bumped into a guy we had met from Calgary at this point as well, which was nice to have someone to talk to. As the days progressed, it was surprisingly quite difficult to find people to talk to given the nature of the trip. We never saw him on the trip again. 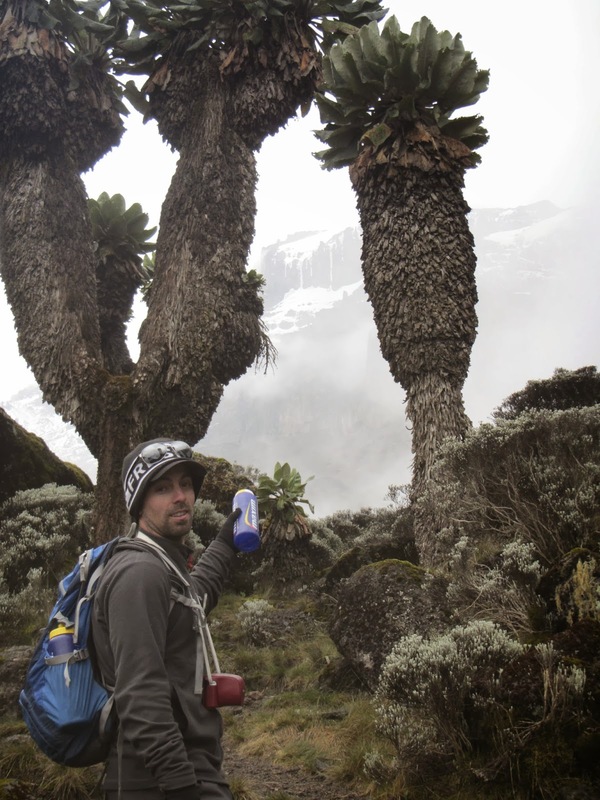 Daniel then brought us over to our porters and we met our second guide, Bryan. Bryan is a guy just about our age, fun-loving, loud but charasmastic and very respectful. I felt at ease instantly with him. Bryan started us on our journey on the short dirt road. He showed us the monkeys waiting for food and researchers driving up in their jeeps. The pace was initially a bit of a shock for Ben, but well liked for myself. ‘Polay polay’….slowly slowly…’sippy sippy’…the words we’d hear every day for the next five days. And so it begins. Lush rainforest welcomed us on the first day. It rained on and off, but we really never felt it with the thick canopy. As we continued to climb, we passed the ‘start’ sign – basically, you’re stuck now as this is an ascent only route. It was certainly amazing and humbling seeing the porters fly past us up to camp with 15kg loads balanced on their heads or necks in nothing but a pair of old runners worn to the sole and dripping with sweat. Around us, the jungle was amazing. Ben’s hip flexors were sore quite quickly – he was a bit worried. I had some hiking poles and was dominating the early hill, but polay polay. 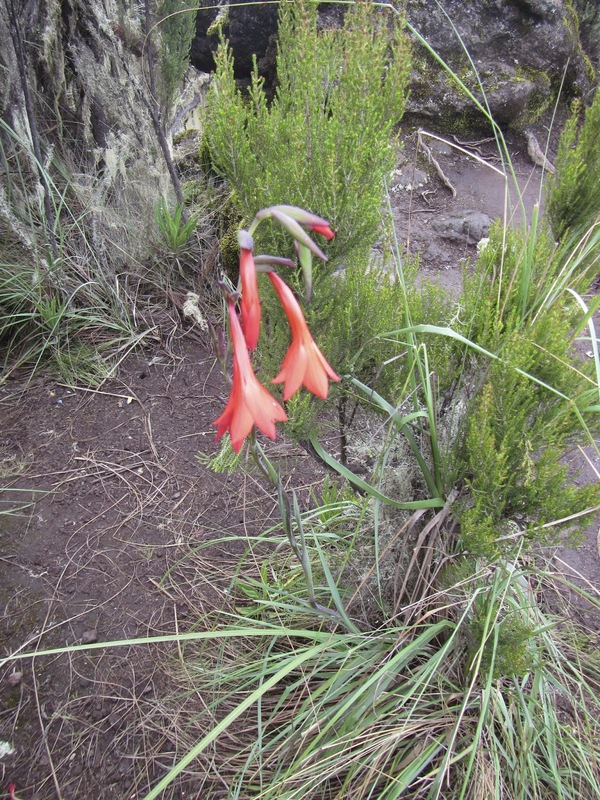 A number of flowers were seen on this route and we captured a few with our camera. 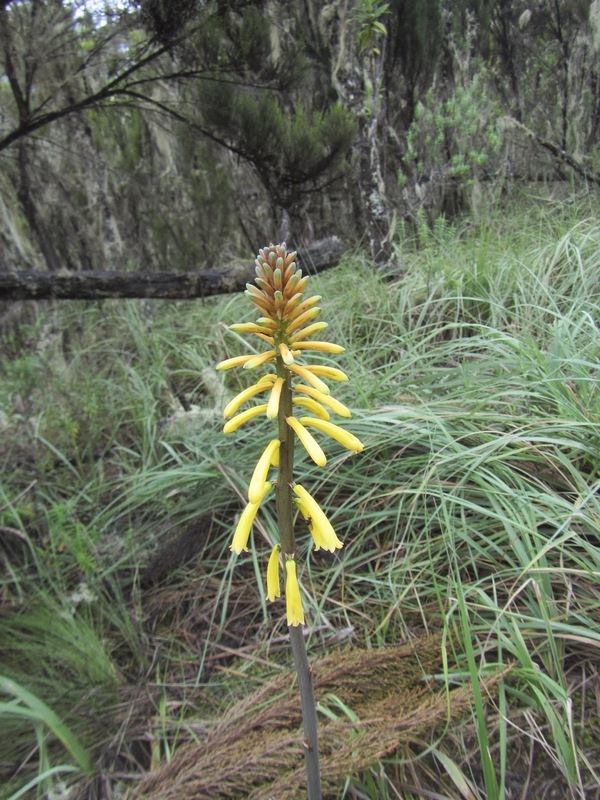 My personal favorites were the Hot Red Poker flower and the Ingatinus kilimanjaricus (hooked flower). During the ascent, a Finnish two-some came up behind us and in their Finnish accent said, ‘Stay to the left, here comes our cook – we call him Chef’. Maybe it was the fact that it was just the two of us, but this cracked us up and still does today. One of those things I guess. Slowly the rain forest became….this. 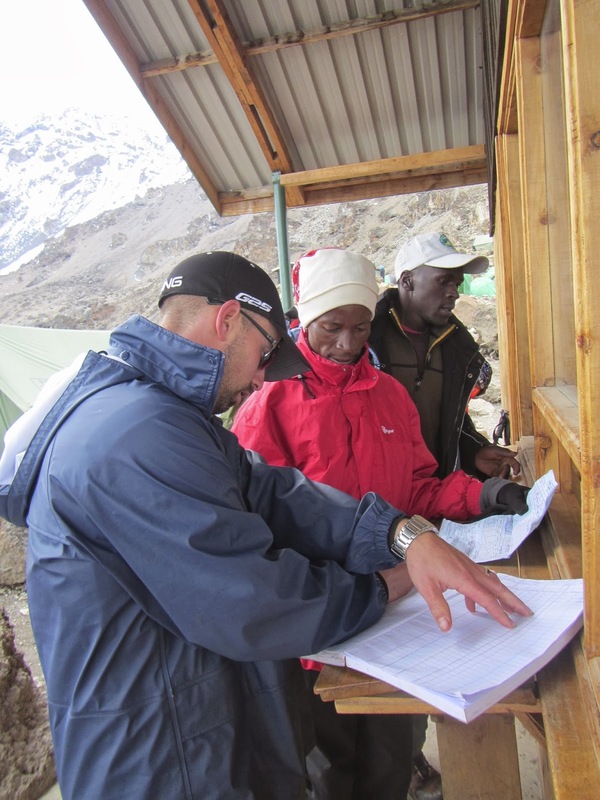 Our first camp was at Machame Camp (3000 meters). 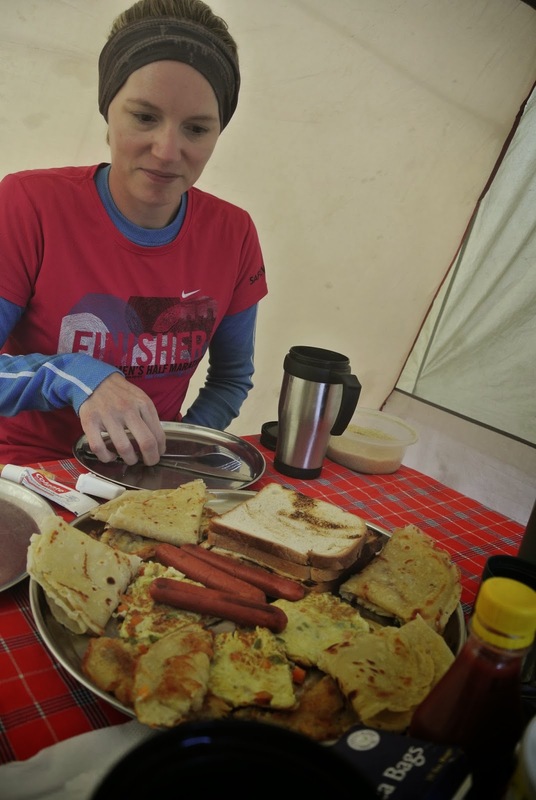 We learned our routine at this first camp – arrive, sign-in with the ranger at the hut and go rest in the tent until ‘washy washy’ time or meal time. It was pretty crazy that our first camp was at an elevation as high as our local mountains in Canada. The site we were assigned was right next to the hut and was our least favorite site of the five we stayed in. Being a female, I was introduced to the toilet. Hmmmm….how does one describe this piece of work. It took a couple of goes to get the right position but it worked eventually. Some people had recommended a ‘she-wee’…I laughed. After using the toilet twice, I cried I didn’t have one. Haha…(not really). First camp @ 3000m Think about it, our lowest camp is as high as most "bigger" mountains in the Rockies. Our first camp @ 3100m. It was located on the edge of the rain forest and Moore land. Every camp, we need to sign in to the wardens cabin. Then Daniel pays our fee. 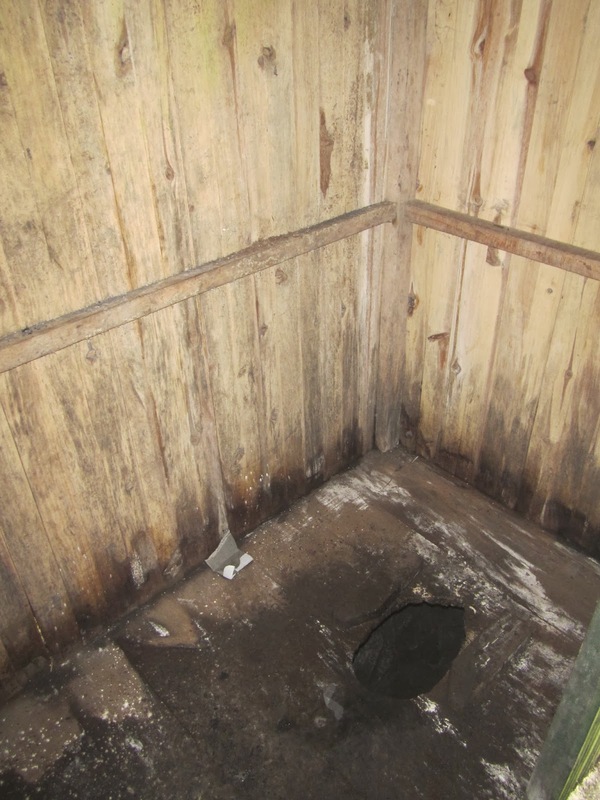 A typical outhouse…unless you were fortunate enough to have one of the rare sit-down stales…though still no treat. A porter arrived with our hot water to wash, his name was Jeremy and he was to be our server for the 6 days. It was welcomed after our cool down and rest. 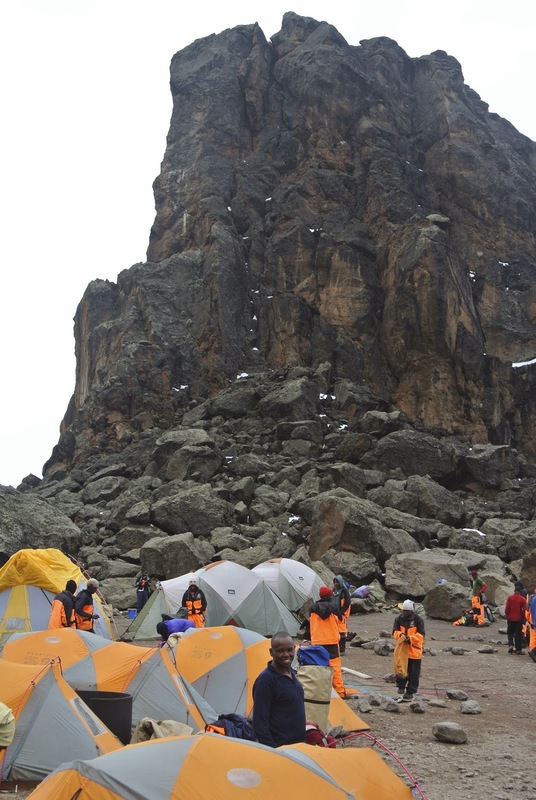 He then guided us to a larger tent for popcorn and Kilimanjaro black tea. After the snack, we took a brief look around the site. We saw some very large groups with nice tents and even the portable toilets we’d heard about. As we laid napping/resting, hikers continued to shuffle into camp after 6pm that night. Dinner was to follow, followed by our first night at 3000 meters. It was short and chilly, but easily manageable. Side note: We tried explaining to Bryan what butter was. For the life of us, he could not grasp our descriptors (like really, how do you explain it?) Later, we found out its called FAT SPREAD…we all had a good chuckle. Jen and I were wide eyed by 1am. We would learn that this would be the norm for the next 5 nights. I decided to go out for one of my reluctant pee breaks (Diamox increases frequency), and as I finished tripping over Jen and fumbling with the zipper to just get out, I heard something I haven’t heard in a long time…nothing. Surrounded by dozens of tents, perched on a 3000m ridge, amazingly there was not a gust of wind, not a snore, nothing. It was actually surreal with the mountain way off in the distance. Actually, there was one sound…one of our porters seemed to snort around 4am every morning…drove me nuts, but we were normally awake by then. Edge of our first camp on our way out…heading up. What we have to look forward to on day 2. Hike started at 7am after a delicious cream of wheat porridge, eggs, bread, and hot dogs. Our path would take us straight up through large boulders through the region called Moore Land (Semi-dessert). It had reminded Jen and I of Camelback Mountain in Phoenix. 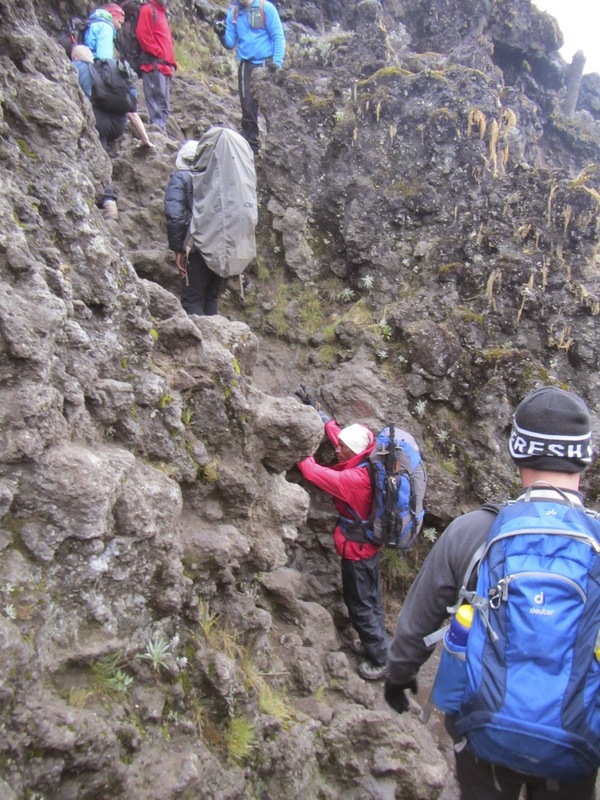 The path was quite wet, as Tanzania had been experiencing more rain then normal. Throughout the morning, Daniel noticed we never took many breaks. We were always used to quick hikes with breaks in Canada (to the chagrin of Jen)….but poley poley….no need to stop, so as a result, we began to pass group after group and this soon became the trend. At one point, we caught a glimpse of a rare eagle. Daniels reaction caught us off guard. He was usually quite laid back as we asked question after question after question on anything about the mountain and Africa in general. Daniel then explained that this eagle was rare to spot, and he had only seen it maybe every 7-9th trip (he has done 92 in total to date). This path just seemed to go on and on. Officially in the Semi-dessert. We walked a ridge for several hours. Our lead guide Daniel. Look how high we are after 1.5 days! One of our first spots where we could see out of the tree line. We were pretty pumped haha. 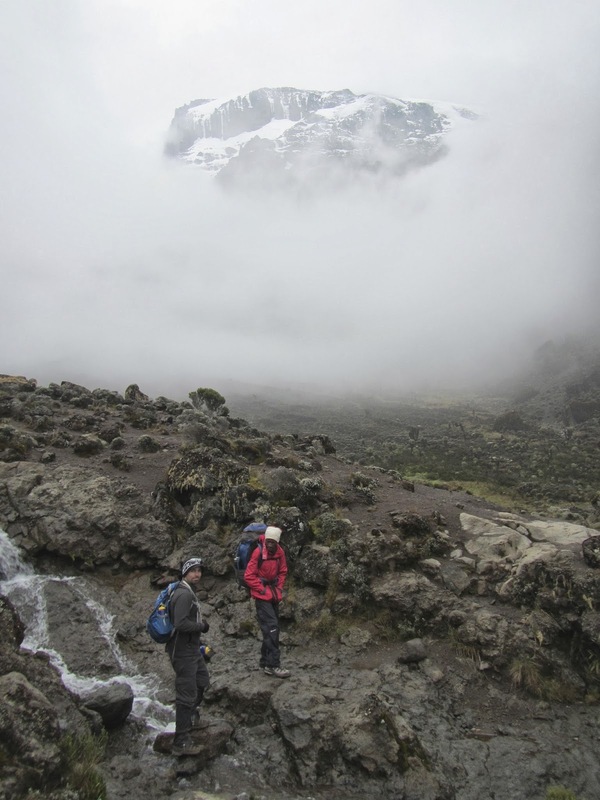 The clouds began to roll in and the air cooled as we reached 3900m before heading back down to our second camp at 3800m. This camp was big, flat, and ugly, but our site was located away from the crowds and the toilet was quiet. The Lemoche route was 100m further at Shire Huts campsite and its path would later join ours. We arrived…surprised on how big the site was. Everyone set up on the other side…suckers. We loved our location…had a quiet outhouse to ourselves. Our chef's tent (looks like soup is on). Our assistant guide is the one sitting down…he knew EVERYONE! We both had slight headaches and Jen also had some nausea but nothing too concerning. My heel was also getting sore from a stupid injury I had acquired at work breaking ice on the river. Settling in, I saw my first 4 stripped grass mouse, though we would see these throughout the trip. We also saw our first local raven which has a white stripe on their back, as well as their version of a sparrow (more yellow with stripes)…I got a kick out of them. We took a short break in the tent while it rained for an hour or two. Once the clouds lifted and the rain subsided to a light mist, we walked to the neighboring Shire Camp (Lemoche route) to meet with some of our guides friends…boy did they get along. After 20 minutes, we headed back for dinner and straight to bed….we are still trying to learn how to sleep past 2am! Then the mist/fog blew in for our second camp @ 3800m. For dinner we had pumpkin soup, curry rice with beef, and watermelon. We continued to have never-ending tea, which by the end of the hike, we would be sick of lol. Side note: It is quite amazing how hard the porters work. They basically live on little to nothing, are dressed in worn out hand me downs, and have to beat everyone to each camp and have the camp ready for us. They actually run, and to no surprise, do take a rare fall. We saw several, some that looked serious, but they would just get up and continue because their job depended on it.